A metal seated ball valve, forged steel A105N body, lever operated. The metal seated floating ball valve refers to a typical floating type ball valve(usually forged steel) which adopts metal to metal contact between the sealing surfaces of the ball and seat. Proper face-hardening process shall be conducted including ultra-sonic spray coating, nickel-based alloy spray welding, stellite spray overlay, as well as ceramic material coating, etc. In order to meet the “zero leakage” sealing requirement, the ball shall be carefully ground to extremely accurate roundness and smoothness by rotating the ball and grinding apparatus in different directions. 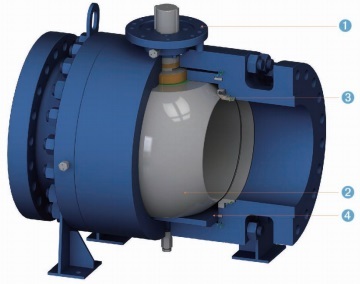 Design features of metal seated floating ball valves, two piece split body, side entry. (1) Top mounting pad design as per ISO 5211. Optional worm gear, electric actuator and pneumatic actuator are available. (2) Hard faced ball and seat to satisfy the requirement of high hardness, high temperature resistance, and wear resistance. (3) Under the stress of preloaded spring, a tight sealing is secured even in low operating pressure. (4) Self-cleaning dust proof seat design is available. The material selection of metal seated floating ball valves includes body and all trims’ materials which are listed in below table. 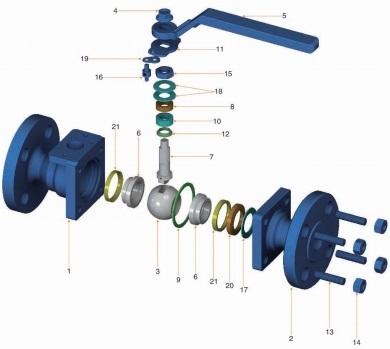 The 3D explosive view of a metal seated floating ball valve, 2 piece split body, side entry. The conventional material selection for body and all trims of a metal seated floating ball valve, side entry, 2 piece split body design. "WC" refers to Tungsten Carbide overlay for hard facing. "N2" refers to nitriding heat treatment.